In partnership with Reinvent, each speaker will explain the key developments in their field that people outside the field should know about, developments which could help solve the major challenges of our time. This series is an expansion of the highly successful What’s Now: San Francisco series that has featured many top-tier innovators and intellectuals rooted in Silicon Valley who are trying to more fundamentally reinvent systems to deal with the mounting challenges in our 21st-century world. America’s got a fundamental problem with how information flows through its economy and society. Encouraged by a light touch regulatory framework, early internet business models – from Amazon to Facebook – have metastasized, in the process creating an information architecture that’s proven toxic to our society. 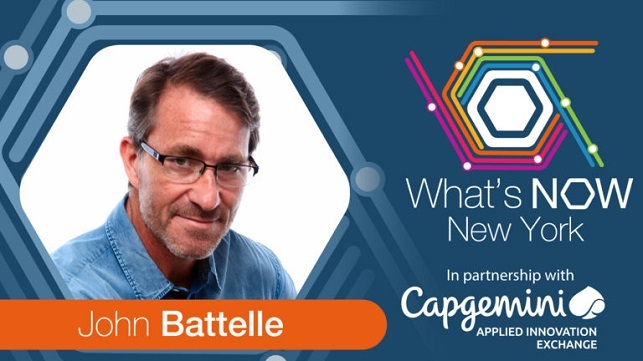 As John Battelle, our guest at the January What’s Now: New York event, sees it, the problem comes down to who controls the flow of information in our increasingly interconnected world. But to understand that flow, we first have to visualize it, then we must imagine alternatives. As hearing after hearing in Washington has proven, we’re failing at this basic task. Data is often understood in terms of ownership and personal harm, and certainly these are important factors. But data flows through systems, and these systems are not well understood. For example, Facebook leases our data to advertisers, but neither the advertiser nor the Facebook user has any transparency into how that data is managed, manipulated, or categorized. Amazon connects customers to a wide range of products, including Amazon’s own, but none of the participants in this process have access to how their data interacts with Amazon’s systems. And it is these systems which have directly impacted America’s economy and democracy – often with dramatic consequences. Americans are now facing up to the fact that we need some layer of governance that reworks the system and ensures that not only the tech middlemen benefit, but that the rest of our economy and society thrives as well. Almost all businesses that use online marketing and advertising, or that are involved or compete with online retail, will be impacted by the outcome. Battelle is the perfect person to explain how the system actually works today and lay out better ways forward. A serial entrepreneur who has co-founded and run more than half a dozen startups in the San Francisco Bay Area, Battelle writes frequently about media, advertising, and technology issues, and is the author of a best-selling book on Google called The Search. In the last year he’s been called on as a leading authority to testify before the U.S. Senate on what to do about Facebook, Google, and the other tech giants. Battelle now lives in New York City and is teaching a course on Internet Business Models and Technology Policy at Columbia University’s School of International and Public Affairs. At Columbia he and a team of grad students are working on a project visualizing data as it flows through the digital advertising ecosystem. Battelle believes there is a way to create an ecosystem of true innovation that reworks the way data flows through society and who owns that data. Key to such a system is machine readable data portability and an associated overhaul in the private “shadow regulation” of companies’ Terms of Service. Battelle will lay out his early thoughts on a new way forward and we hope to have others who can add their ideas. Join us for what will be a fascinating conversation about the future of marketing, advertising and retail in the midst of the National Retail Federation’s Big Show in New York. The future is already here, it’s just not evenly distributed, the Sci-Fi author William Gibson famously said. That insight has inspired many a trendspotter to seek a glimpse of the future before everyone else comes to understand that it’s actually the next big thing. Almost all businesses – from early stage investors to small firms to multinational corporations – wrestle with some form of trying to figure out what leading consumers really want now, and what the bulk of consumers will obviously want tomorrow. 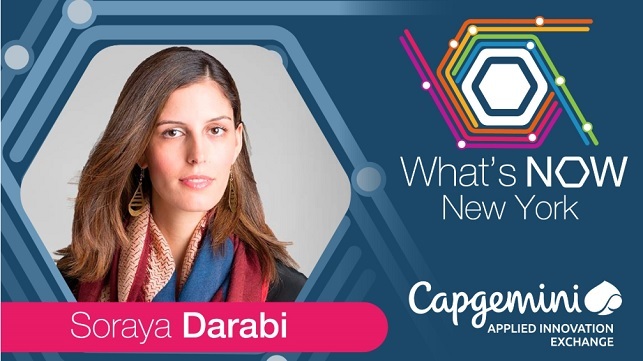 Soraya Darabi, our next guest at What’s Now: New York, is a bonafide expert in figuring out what’s cool now that’s coming next. The relatively young entrepreneur co-founded a couple highly successful venture-backed businesses, the retail startup Zady, one of Fast Company’s top 10 most innovative retail companies in 2014, and the Foodspotting app, acquired by OpenTable. She went on to found her current company Trail Mix Ventures, a venture capital firm investing in trend-setting companies that are primarily appealing to the Millennial Generation. The Millennial Generation is America’s biggest generation and now ages 36 to 22. Millennials are not kids anymore – they are the key consumer demographic that increasingly drives the economy. One key differentiator is that MIllennials value experiences over things. These can be physical experiences, or even mental experiences. Soraya says these experiences often have something to do with living well, leading more healthy, balanced lives. She also says when it does come to buying things, they want fewer but better things. Look at some of the most successful new companies that are connecting with Millennials: like Allbirds, the unicorn selling wool shoes, or Sweetgreen, promoting simple, seasonal, healthy food, or Casper, upending the old-school mattress business. They all have some common characteristics like selling direct to consumers, partly to drive down prices for hard-pressed Millennials, but mostly to build a direct relationship with them. These pioneers as showing the way forward for many businesses. Join us as we explore this future of consumer products and experiences and get a better glimpse of what’s coming next. Traffic congestion in New York City is bad, but it soon could be much better. Really. Take it from Robin Chase, the co-founder of Zipcar who now leads NUMo, the New Urban Mobility Alliance, our featured guest at September’s What’s Now: New York. One way to understand the current urban mobility problem in New York City and many cities around the world is to see our transportation system trapped between two paradigms. The old paradigm was organized for the last century around personal cars, while the new paradigm that’s emerging will be based on shared modalities, newly easy and convenient because of technology. Ranging from so-called TNCs (Transportation Network Companies) like Uber to autonomous vehicles and even electric scooters, Chase argues that we’re still trapped in the old paradigm’s infrastructure of things like curb-side parking and have not shifted our sights to the infrastructure that will be needed to make the new paradigm work much better for everyone, including more sustainable and livable cities. This impending transportation shift will have huge implications not only for those who live and work in cities, but also whole sectors like real estate, retail, and government taxation. For example, cities currently devote roughly one-third of all space to cars or places to park them. What happens when much of that space gets liberated? Chase is the perfect person to lead us in a conversation of the root causes of today’s congestion, who is really at fault, and how to ultimately solve it. In 2017 the Urban Land Institute awarded her the J.C. Nichols Prize for Visionaries in Urban Development for her lifetime of work. Zipcar, which she co-founded in 2000 and led as CEO for many years, was one of the first pioneers in carsharing and is still the largest car-sharing company in the world. Her latest venture is leading the New Urban Mobility Alliance, housed in the World Resource Institute’s Ross Center for Sustainable Cities, named after its major benefactor, Stephen M. Ross, the prominent New York City developer. NUMo is out to move the conversation forward on how to channel the tech-driven disruption to make cities more livable – starting with alleviating our current traffic congestion. Join us for our timely event, which kicks off New York City’s Climate Week, and get better positioned for the transportation transition that lies ahead. Sounds too good to be true? Come to the next What’s Now: New York, done in partnership with Capgemini at their Applied Innovation Exchange, and hear serial entrepreneur Brian Sager explain what Artificial Intelligence is capable of right now and lay out the good news implications for fields from finance to pharma, from medicine to law. Sager is a polymath with experience in biotech, clean energy, and now machine learning. His latest company, Omnity, is taking advantage of the latest developments in machine learning to create next generation search. They are five years into development and currently working with top companies in pharma, finance and law, among others. Sager will talk about the general state of play in the field and what that means for any business or organization pursuing innovation in any field. All of us have a stake in accelerating more innovation to solve the many challenges that the world faces right now. Ideally, step one would be to quickly establish what’s already known about any particular problem in a field, searching across all languages and countries around the world. Step two would be to connect up any of the world’s 200 million knowledge workers with knowledge or expertise related to solving that particular problem. Fortunately AI has reached the point where it can now routinely help us solve those two daunting tasks. Get ready for the rush of innovation to come. What does a day trader in the world of finance have in common with an emergency room technician in a hospital? Both are using all their talents to achieve short-term results with little to no long-term impact. Both are fixated on solving an immediate need with little focus on how to fix the system for the future. Dyson is trying to help get us out of that trap for the good of all parties – finance, healthcare, the tech world and society at large. Her Wellville nonprofit startup is attempting to simulate collective investment in a range of public health and wellness institutions (as opposed to short -term projects) that will bear healthy fruit over time. What’s a nice tech investor like Esther Dyson doing in Muskegon, Michigan? Dyson was an early tech guru, impresario of the highly influential conference PC Forum and newsletter Release 1.0, friendly with Steve Jobs and Bill Gates. She was a shrewd angel investor and board member of visionary startups, and a pioneer involved in new ventures in the post-Communist developing world. Yet now she’s regularly flying from her base in Manhattan into a handful of small communities in America’s heartland, trying to spread the same message of long-term thinking and learning through trial and error that pervades Silicon Valley (but without the frivolity). The problems she’s addressing have a lot to do with time. At July’s What’s Now: New York event, presented in partnership with Capgemini at their Applied Innovation Exchange, Dyson will lead a conversation about how we need to rethink private and public behavior by shifting from short-term to longer-term horizons. Speaker: David Edwards – Inventor, and Harvard University Professor of the Practice of Idea Translation in the School of Engineering and Applied Sciences. David Edwards is an inventor and entrepreneur with no less than three startups in this new space and he will anchor our next What’s Now: New York event where he will talk about this new frontier of sensory experience and the wave of innovation that it is starting to drive. Way back in 2010, Eli Pariser came up with the term filter bubble, the idea that people on the Internet tend to see only information that agrees with them, and then he published his book The Filter Bubble: What the Internet Is Hiding from You. As filter bubbles become a more central problem in online discourse, Eli’s been on the hunt for potential solutions. Join us at the next What’s Now: New York, produced in collaboration with the Applied innovation Exchange, where Eli will share what he’s learned about how to pop the filter bubble and begin to knit the internet, the economy, and America, back together again. He has some ideas, but far from all the answers, and he wants to use the event to gather innovators from other fields to help figure this out. Chris Hughes, one of the co-founders of Facebook believes income inequality has become one of the biggest challenges of our time and has dedicated himself to rethinking the fundamentals of our economy. As co-founder of the Economic Security Project, Chris champions the economic policy innovation of Universal Basic Income, or UBI. Join us at the next What’s Now: New York for one of the first events following the publication of his latest book Fair Shot: Rethinking Inequality and How We Earn. Chris will anchor a conversation that will go deep into the ideas of the book with those gathered (everyone in attendance will get a free book). He left Facebook to become one of the core team members of Obama’s legendary digital team in Chicago during the 2008 election, which changed political campaigns forever. He then bought the New Republic magazine and tried to remake it into a digital media company and help transform the media world, with, he admits, less than stellar results. Our conversation can be expected to range from his thoughts on the backlash against Facebook and tech platforms, to the chaos in media around fake news, to how the economy could get fundamentally rebalanced and American politics could be renewed. Come for a stimulating conversation as well as free food and drink, and meet a growing network of innovators from many fields. If you are interested in attending, please email contact@reinvent.net. If you can’t attend in person, this event will be streamed live from our website. We’re in an extraordinary moment in the healthcare industry—similar to where the web was in the mid-1990s. Just like the Netscape IPO marked the beginning of a boom in 1995, Fitbit recently going public marked a new era in digital health. People in the know can see how the whole industry could be transformed over the next five years. The $1000 sequencing of a person’s full genome will soon drop to $100. Watches and phones are embedding clinical-grade medical sensors. Prosthetics are already being produced on 3D printers at home. Consumers even have access to new diagnostics and data to get much better clarity on how they may ultimately die. The more these developments, and the next ones to emerge, scale to larger numbers of people, the more the whole industry will change. This is how Unity Stoakes and his company StartUp Health sees the new world of health. Unity is a seasoned entrepreneur from the mid-1990s era of the Internet who waded into the healthcare world in 2005 with his long-time business partner Steven Krein. Together they co-founded StartUp Health in 2011. StartUp Health is what they describe as a health moonshot factory – an unusual blend of venture capital firm (with investments in no fewer than 215 companies in the health space), academy for entrepreneurs (an accelerator that maintains long-term relationships to their companies), and media platform. StartUp Health is trying to create the community of startups that its founders wished they had found when they first tried to navigate the complex world of health. “June Cohen invented TED Talks and scaled their views to 100 million a year. Deron Triff then took TED Talks to 100 million views a month and 1 billion views a year. The two of them are now co-founders in a first-of-its-kind content incubator in New York that’s all about inventing new forms of media, launching them into the world and bringing the audiences to scale—like what they did at TED. The media world is certainly overdue for another round of invention. The industry has never been so fractured and once again is under mounting stress—in many ways mirroring what surrounds it, both in America and the world at large. June and Deron think that any innovation in the media world that finds better ways to connect with people and bring them together would be good for the world at large too. In other words, media innovation is not just about media, but also about changing the world for the better. We’re in the early stages of the Third Digital Revolution and few people understand what’s about to hit them. The first two digital revolutions – in computers and communications – transformed the world, but the next revolution in fabrication is poised to make an even bigger impact. Neil Gershenfeld, Alan Gershenfeld, and Joel Cutcher-Gershenfeld are using December’s What’s Now: New York as the official New York launch party for their new book Designing Reality: How to Survive and Thrive in the Third Digital Revolution. In 2003, just 15 years ago, Neil kicked off the fab lab movement, in which individuals generate an impressive array of objects through community access to tools for design and fabrication. Since that time, the number of fab labs has doubled every year and half. The Gershenfeld brothers argue that a world where local communities can make most materials and objects is not science fiction, but a near-term reality that will disrupt many current manufacturing businesses and remake the world in unforeseen ways. For example, many current notions of globalization and planetary supply chains might need fundamental rethinking. Neil believes that digital fabrication could soon lead to a billion-fold gain in performance and end up altering the very construction of core materials. Alan and Joel, who have backgrounds in the social sciences and digital media for learning and social impact, have thought through the implications of that world, both in terms of its possibilities and potential dangers. Could this Third Digital Revolution play a critical role in solving climate change? Will it mitigate or exacerbate wealth inequalities? Few people understand innovation, and the peculiar kinds of innovation practiced in both New York and San Francisco, better than Steven Johnson. The best-selling author has written 10 books that essentially all deal with innovation, and he maintains a home in both places, shuttling his family between each. Steven is the perfect person to launch our inaugural event in our new What’s Now: New York series. He’s also the perfect person to lead a conversation on how these two dynamic regions could complement each other in driving more widespread and fundamental innovation through America’s business, economy, society, and politics in the coming decade. Many Americans are close to despair about the state of the country’s paralyzed politics, mounting inequality, and increasing climate change. That despair has also led to an increasing backlash against the role of Big Tech in our lives and in our politics—a debate that Steven has been engaged with in several books and articles that he has published over the past few years. Join Steven and a group of innovators and intellectuals from different fields for a what promises to be an important discussion and an enjoyable evening. Steven led a conversation in our What’s Now: San Francisco series at the beginning of this year where those gathered helped him think through what’s needed to improve long-term decision-making, the subject of his upcoming book. This What’s Now: New York event coincides with the launch of the paperback version of his last book: Wonderland: How Play Made the Modern World, which looks at the role that a childlike curiosity plays in innovation, with examples rooted in both New York and San Francisco. Everyone who attends will get a signed copy.